HOUSTON (KTRK) -- We have an update to a story that we reported Monday on Eyewitness News and abc13.com. 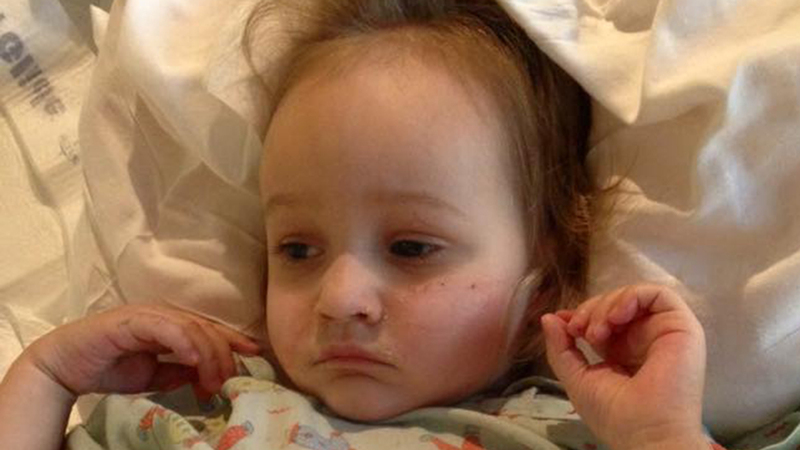 A little girl who became seriously ill after swallowing magnetic toys is on the mend. And her mother is responding to criticism from a handful of people she's getting online. On Tuesday, two-year-old Ava Kendall was moved from the ICU at Texas Children's Hospital to a private room. She's now listed in fair condition. Ava had been in ICU after becoming violently ill.
Ava had grabbed and swallowed magnetic balls. "Magnets find each other, even though skin," Lexi Kendall, Ava's mother said. "They had burrowed in her intestines, creating holes." Ava had several surgeries to repair the tears and the infection was brought under control. On Tuesday, her mother posted an update. "Ava is still very jittery (suffering withdrawals) and still won't talk to us," Lexi posted online. She seems very scared and confused. Until the tube gets taken out of her nose, she will not be allowed to eat, so we are hoping that comes out very soon." A few people took to social media after our story ran, some calling Lexi a bad mother for allowing Ava to eat the magnets. For those people, Lexi posted a message. "A bad parent would not have had the courage to come out and talk about this, in the midst of everything going on. A bad parent would not have listened to their gut. I love my children with all of my heart, and I would do anything in the world for them. When I see someone post: "where were the parents?" or "the parents were so stupid to leave those in their child's reach!" or my favorite - "the parents need to be prosecuted for negligence!" I can't help but worry for those people. I have a 5 month old, and as a parent, sometimes you need to be taking care of the screaming baby instead of keeping eyes on the happily playing toddler 24/7." A GoFundMe account to help with Ava's medical bills has been set up.